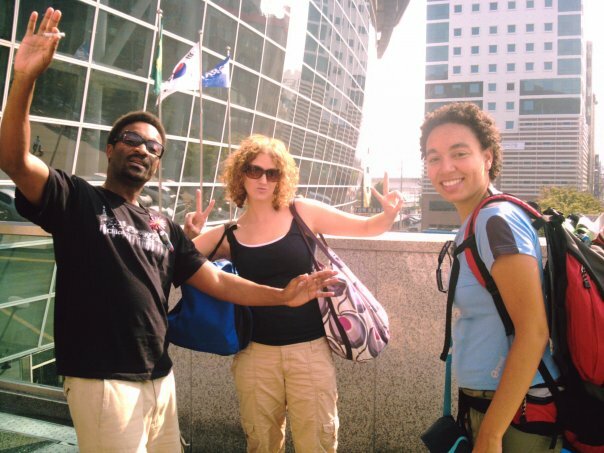 The first thing we noticed about Busan was how much it looked like Seoul. When we left Busan Station, we felt a little comforted by the familiar “Lotte Mart” sign across the road. We saw the crowd lining up to buy subway tickets. We hoped that our T-money cards from Seoul would work in Busan, but they didn’t. They are supposed to work in Busam, but somehow we couldn’t get them too. We got in the line and got our tickets and entered the new subway system. It was like being in a parallel universe. It looked a lot like Seoul’s subway, but not quite. There weren’t enough subway lines. And the ajimas were… nice. At one point during the trip, we were standing in front of a ticket machine trying to figure out how to get to the beach. An old lady came by and she was pointing to the map on the machine. Being a Seoulite, I assumed that she wanted to cut in line or rob us and leave us for dead. 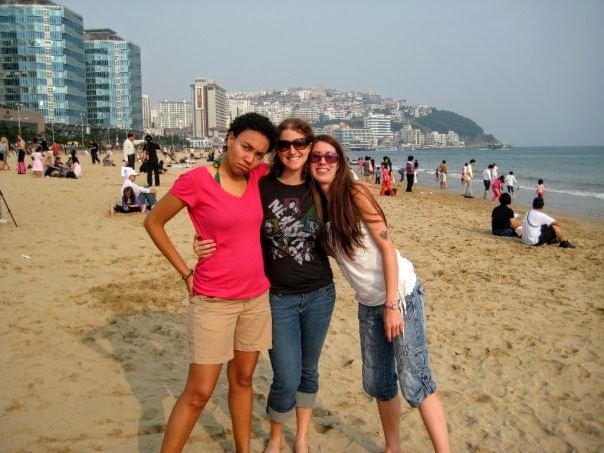 But in Busan, the city of smiles, she was just trying to show us the best way to get to the best beach. I’m just kidding. An ajima, an married lady, from Seoul would never rob anyone. They just like elbowing, shoving, pushing, and stealing seats on the subway. But they would totally leave you for dead if they had the opportunity and enjoy every minute of it! Friday was an usually warm day, so our hopes were high for a day at the beach on Saturday. We had stayed out late on Friday night and our plan was to just lie around and swim a bit. I love to swim, especially at the beach. 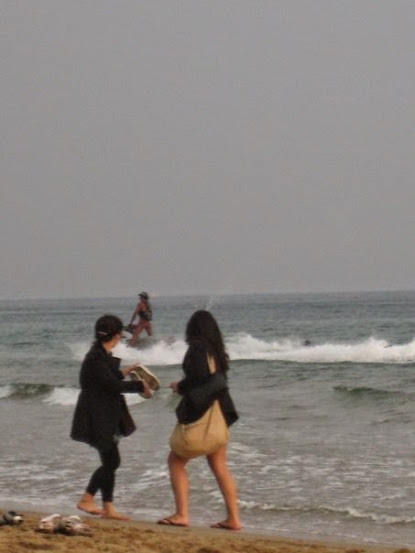 So when I got to Heaundae beach it seemed like a sin to have traveled all the way to Busan and not even try out the water. I went in first. Vicky followed. Vicky and I were the only 2 people in the water. It was cold, but I managed to stay in for a good 20 minutes before turning blue. Vicky and I teased and taunted Taryn to come in and join us. We lied to her and told her that it was only slightly chilly. She fell for it. Titus claimed that he didn’t have anything to swim in. So, he guarded the purses… a man’s job. We got out of the water and Titus, Vicky and I played frisbee on land for about an hour. That’s when I first saw him… The Thong Man of Busan. At first I thought he was naked. He had really dark skin and he was wearing a teeny tiny red thong. He was playing frisbee with his friends too. He loved the attention, but not enough people were enjoying his thong. He had to do something… take his thong on the road so to speak. He rented a jet ski. Now, he could move faster along the beach. But how are the people going to really see him? Taryn caught this perfect moment on camera. Aha! He stands up proudly on his jet ski. Now his buttocks are in full view of everyone. The people are pleased. It’s all about the people you know. When I saw “Thong Man” doing his thing on his jet ski, I had only one thought. “I need to get my photo taken with THAT man!” But how? My goal seemed too high. All three of us practically ran over to him. We had no idea how we were going to ask him to pose with us. What if he said, “No”? Should we snap a picture and just run away? As we got closer to him we saw a group of Korean girls approaching. “Damn it,” I thought, “They have the same idea!” But no, they were coming towards us. They wanted us to say something in their camera. I don’t remember what it was now. Their pronunciation was really bad and we had no idea what they were saying. Luckily, Thong Man stepped in to save the day. “They want you to say…” he said with thongish authority. Then, he put his arm around me and looked into the camera. All four of us said the stupid thing the girls told us to say. “We want another picture!” we said and we handed the silly girls all our cameras. Thong man moved between Taryn and me for a better picture position. Snap, Snap, Snap. 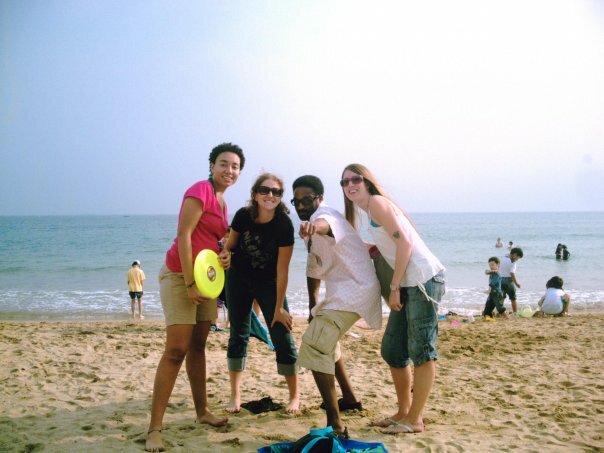 That’s me and my friends with the famous Thong man of Busan!! We walked back to our towels with smiles. 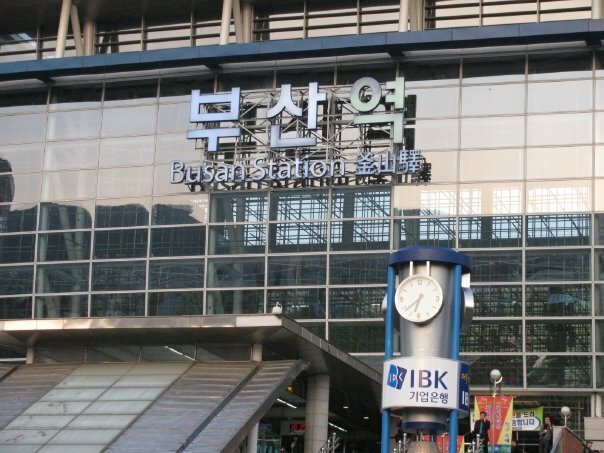 Go to Seoul Station (the subway station) on lines 1 and 4. You can buy tickets for a train heading to Busan. Prices and times vary. Train tickets will cost 20,000–80,000KRW depending on the type of train you ride and what class ticket you get. Busan itself is not an expensive city. The prices for things are the same as in Seoul. The beaches in Busan are crowded in the summer, but no one swims in other seasons. It’s not illegal to do so. I have done it. But, people think it’s strange to swim on a non-summer day no matter how warm it might be. T-money cards work in Busan, but you need to go to special shops to add money to your card, so top it up before you leave Seoul. Go to Haeundae Station #203 (해운대역) on line 2. They cannot close a beach. Bring your own towel. You could buy one near the beach, but they’re pretty crappy. You’re better off buying a T-shirt to dry off with. The beaches in Busan are crowded in the summer, but no one swims in other seasons. It’s not illegal to do so. I have done it.